It's been hectic on our little farm. We're in the process of building a small log cabin that will eventually be our new home. With a few exceptions, it's been cool enough that the bees haven't bothered the carpenters, and I've made sure the bees haven't been bothered in return. 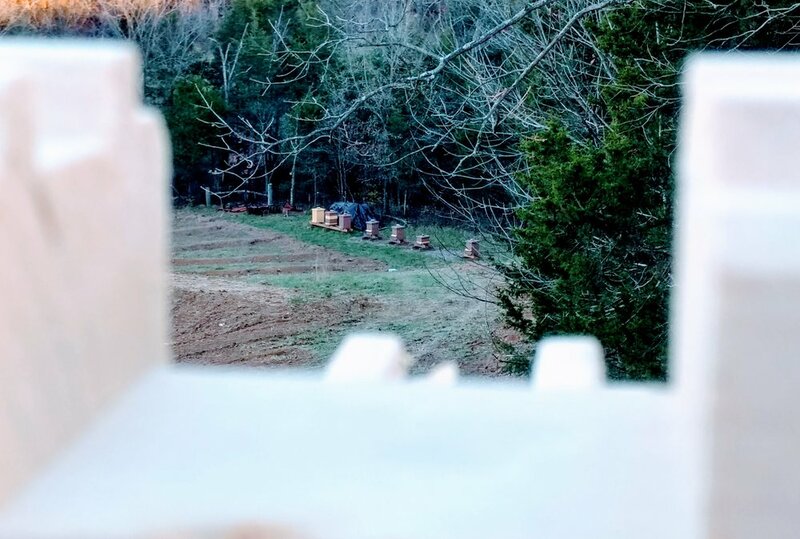 This picture shows some of our hives through the notch in a log wall. In the last few weeks, I've also been clearing another area of brush and sticker bushes. Some of this area, as I showed in my last post, is dedicated to a small orchard. Another section is destined to be a bee yard. I've just got to find time to build some hive stands.